Elle may look like your typical ditzy, rich girl who only knows how to live off of her wealthy parents. And her whole look doesn’t help you think otherwise. But Elle actually has genius level of intellect and is very warm and friendly. While it seems like a relief that she’s not a snob, her kindness can also be her weakness as people tend to step on her and take advantage of her. Elle’s signature color is pink, which makes her look like a real-live Barbie doll with her blonde hair. Her typical outfit consists of pink from head to toe and she mostly has her pet Chihuahua with her as well. 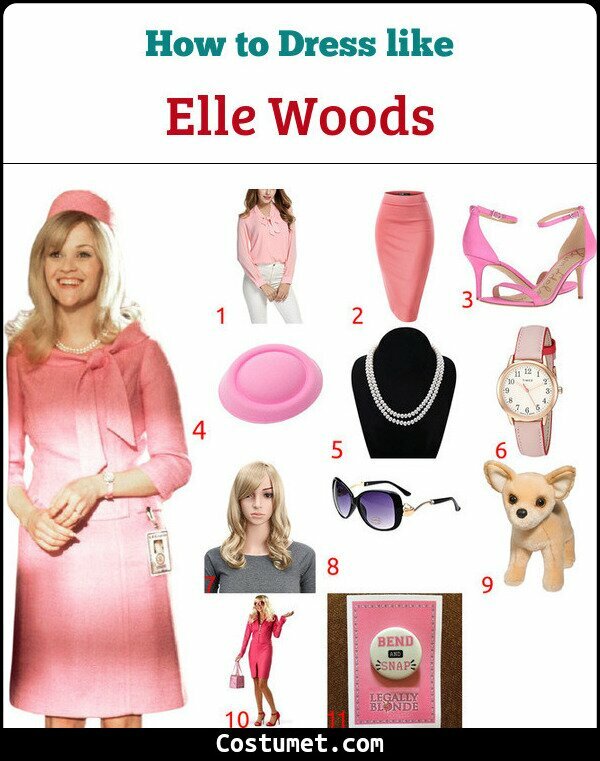 Here’s everything you need to look like Elle Woods. 1 Pink Long-Sleeved Business Top Even though Elle went to Harvard Law, she still keeps her fashion game on top with this smart pink number. 2 Pink Pencil Skirt A pink pencil skirt makes Elle look well put together yet softly feminine. 3 Pink Heels Elle keeps her outfit well-matched with a pair of pink heels. 4 Pink Stewardess Fascinator A key piece of one of Elle’s iconic looks, this pink stewardess fascinator is an amazing accessory to have. 5 Double Pearl Necklace Add a touch of elegance to your Elle outfit with this double pearl necklace. 6 Pink Watch Elle also accessorizes with a pink watch. 7 Blonde Wig Elle is also known for her ice blonde hair so don’t forget to wear a wig if you have to. 8 Big Sunglasses Show off your fashionista side with this oversized glasses. 9 Chihuahua Plushie Keep Bruiser with you all of the time. 10 Full Costume You can also buy this costume set if you’re pressed for time. Elle Woods was portrayed by actress Reese Witherspoon for the two Legally Blonde movies and the upcoming third installment as well.